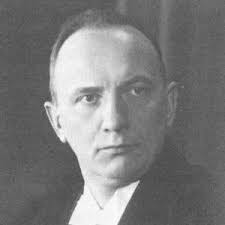 March 23rd, 67 years ago, Klaas Schilder died. The Lord used him to feed His sheep in the green pastures of His Word and to fight against the wolves that attacked the sheepfold. That struggle for the truth was a path of much tribulation. As he warded off the attacks against God’s truth, his sharp polemics were not always appreciated. Shortly after Schilder’s death, one of his theological students related the following anecdote. It contains a vital message, also for us. In Acts 14, Luke relates how Paul and Barnabas told the believers in Asia-Minor that they “must through many tribulations enter the kingdom of God”. to Himself. For that’s just what our departed brother experienced in his life—that we must through many tribulations enter the Kingdom of God. Schilder did not find that strange. He knew that contending for the faith that was once delivered to the saints would bring with it those tribulations. And he kept reminding others of it. Allow me to relate something in connection with that from my college student days. You know how that’s a time wherein, as (theological) students, you are inclined to be quick to criticise. At least, that’s how it was in our generation of students. Every week we diligently read the church magazine De Reformatie (The Reformation), but we had quite a few critical comments to make about it. We had quite a few reservations, in the line of: Is this really the way to write? Can’t they put it less sharply? A bit softer; a milder ‘tone’? Especially the last bit about the tone was the ‘in’ word at that time. So we asked the professor (Schilder) to make an evening available for us; which he then also did. First, he patiently waited to hear what the student gentlemen had on their minds. And so, by him asking a few questions, our objections came to the fore. After we had relayed what was on our minds the professor gave his response. I still remember well that he began by reminding us of the words of Christ in the Sermon on the Mount: “Blessed are the peacemakers, for they shall be called the sons of God.” That, he said, is your calling: to make peace. But, he added, you can only make that peace if you stand firm to the utmost for the truth of God. And the end of his speech was: If you gentlemen are not prepared to oppose vigorously even your best friends when it comes to defending the truth of God, it would be better not to become a minister. That has remained an unforgettable evening for me. I then understood what governed Schilder: the truth of God. On that point this brother was immovable. That has also been the background basis of his struggle: as a child steadfastly to remain by the Word of his Father. And now the Lord has taken Schilder to Himself. May the Lord find us all faithful in that struggle for the truth of God. For we must understand that we are to remain in the faith and that in doing so we must through many tribulations enter the Kingdom of God. O W Bouwsma, “Om de Waarheid Gods” in Gedenkt Uw Voorgangers (Remember your forebears): In Memoriam Prof. Dr K. Schilder, Oosterbaan en Le Cointre, Goes, 1952, pp. 99-100. Previous articleDo all believers have a task to evangelise?